Soon after returning to Italy, a small group of visiting friends arrived, each family with a gaggle of children. Okay. Anything above one is a gaggle in my book. There were five in total in the two families. We were fortunate to spend nearly every waking hour for two days with these lovely people, with some local friends smattered in a time or two. And in case you haven't noticed, it is HotHotHot right now in these parts. We had to find water. Love this! Young One is encouraging the young man to "Hurry up, already!" Leaping off of cliffs takes a bit of time for some people, no doubt. Nine year olds have no fear! The second water day was spent at a gorge in Arsiero (province of Vicenza) at the River Astico in an area commonly referred to as La Pria. The Torrente Astico originates in Trentino and is as frigid as it is wonderfully clean. 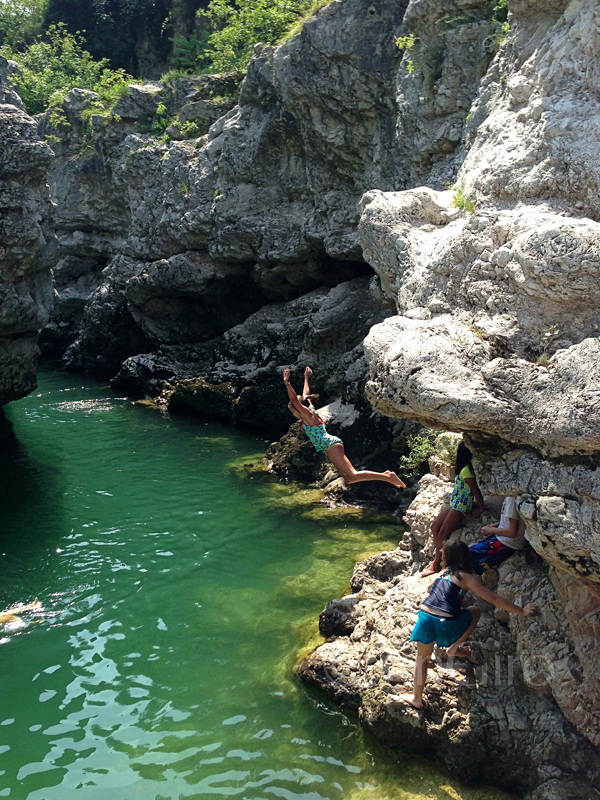 Daredevils (and nine year olds) flock to the area during the hottest parts of summer for a bit of sunbathing, cliff diving, and relaxing among friends. 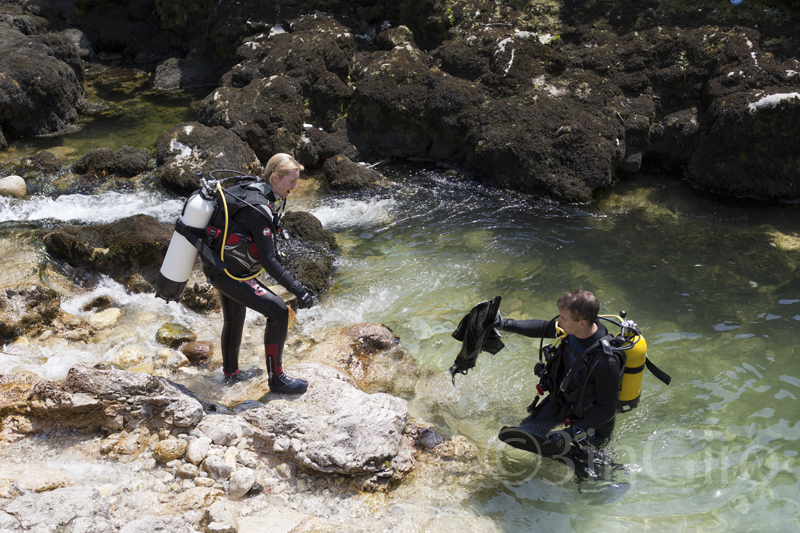 We also spotted several pairs of SCUBA divers making their ways along the deeply carved river. La Pria is indeed a beautiful little piece of nature...and it's absolutely free! 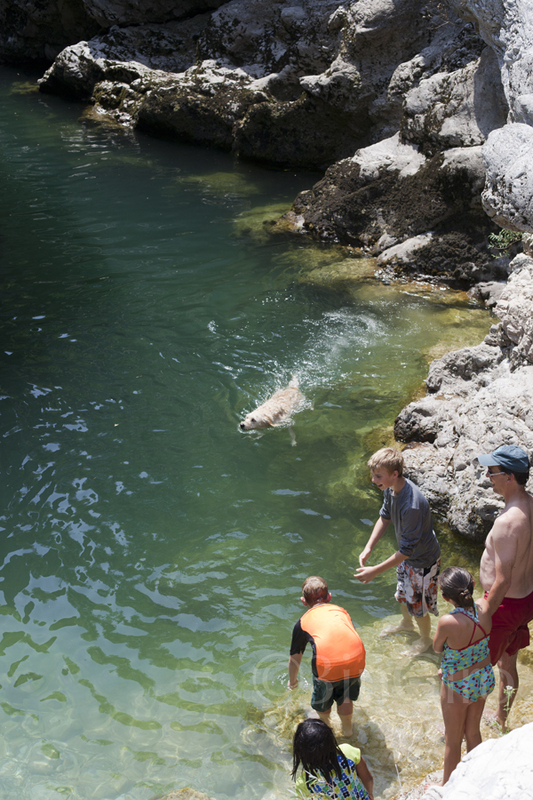 While swimming is certainly allowed, it is nearly impossible as the water is frigid. Alpine frigid. The kids did it anyway. We brought picnics and umbrellas (that we wedged between a couple of rocks) along with our gang of children and one visiting dog. We followed the lead of the friends who brought us there and headed for the area on the left at the end of a wee trail and not near the big bridge where most of the crowd gathered. My girl loved this place. There is a bar of sorts with snacks and drinks but I imagine its hours are spotty. We were there on a Sunday when the place was full of visitors, mostly 20-somethings, but there still seemed to be enough space for everyone. We hope to return before the end of the season. I am not sure I could jump off! Beautiful! I would never jump....now....maybe when I was a bit younger. It was a gorgeous find. What a beautiful place. Your daughter is brave! I wouldn't have been able to jump, esp. knowing how cold the water is. It is indeed beautiful. I have lived here for about nine years now and continue to be amazed by the beauty that surrounds me. It's been quite an adventure. I wouldn't jump because of fear. Period.